I regret to inform you all that I really liked this episode, and therefore my curmudgeonly Classic Who fan status may be at risk, but heck… I really liked it. Not to say it’s perfect. Some of it was a bit silly. I still think Colony Sarff is a pointless idea, and even though the story’s all about the most popular villains ever, they hinge the resolution on a random new aspect of these villains. The immortal sewer idea actually makes more sense than the Dalek asylum did, but unfortunately the Dalek asylum was just cool in a way that the immortal sewer is not, and either way the more often these “revelations” occur, the more bored I become. However. Most of the plot twists add interest and are exciting, instead of totally changing the episode and killing the investment. The twist, re-explaining how the Doctor gets back to Davros with a gun, worked well. Most importantly, the Doctor and Davros get to have the long conversation that was promised, the one I wanted with a setup like this. I could watch an entire episode of the Doctor and Davros talking to each other, and I didn’t think they’d actually give it to me, but they did. 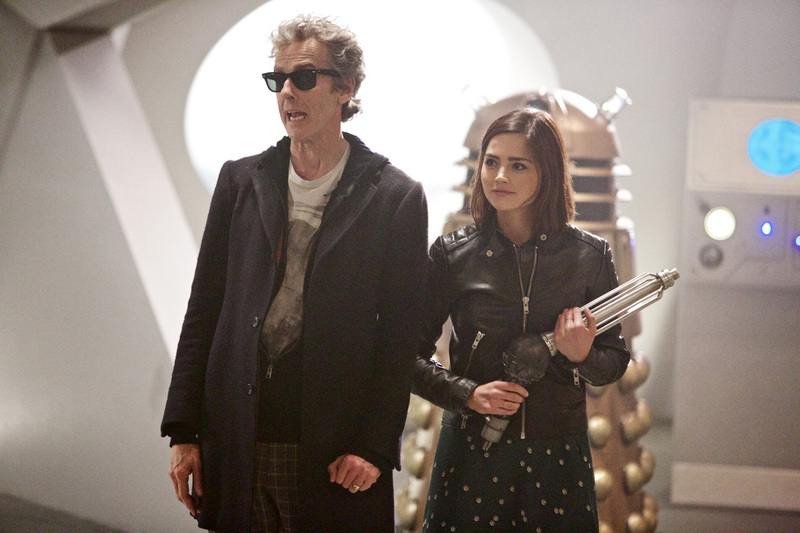 To keep it moving, they cut in a bit of the Doctor goofing off, and a subplot with Missy and Clara coming to save him. Those elements, believe it or not, actually fit with the themes of the episode. Friends inside enemies, enemies inside friends. Obvious, sometimes, but consistent focus is more important to me at this point than subtlety. Missy’s presence makes perfect sense in the episode, given that theme. The idea of putting Clara inside a Dalek — hmmmmmmmmmm — does too, and made for some really interesting stuff between her and Missy, and later the Doctor, about Dalek language. I felt similarly about the episode. Glad to see I’m not the only one who thought Colony Sarff was a rather pointless addition to the episode. He was cool to look at, but I didn’t think he really added much to the story. It seems a lot of people thought he was cool/creepy, so I guess he served his purpose, but really I would’ve preferred a whole episode about creepy snake people. We need to slim these episodes down a little. Not that I’m into Doctor Who (I haven’t watched one episode, although I’m curious to try), but hopefully this episode is a sign that it’ll be good again? It’s not everyone’s cup of tea, but it’s definitely worth a try. I get the impression you’d prefer Classic Who. And yeah, I’m hoping this signals a more thoughtful and coherent season. I really liked this episode as well, especially the scenes between the Doctor and Davros. The Magician’s Apprentice and the Witch’s Familiar works so well as a two part story, it was exciting, and I enjoyed seeing new & classic Daleks in the same episode. Yep! It was solid. I’m interested to see what they do next week with new villains. Yes, I’m looking forward to the next one as well, great next time trailer!